Tozan-ryu Shakuhachi Shihan (licenced teacher of Tozan shakuhachi school) Tutored under Kozan Yamazaki (recording and turing with well-known shamisen group `Yoshida Kyodai`) from 1990`s. Also studying under Tozan-ryu masters such as Taizan Kawamura and Houzan Nomura at the Tozan-ryu masterclasses over last decade. Currently resides in Prague, Czech republic and performs not just Japanese traditional pieces but modern and improvisational style of music, his co-performers include shakuhachi player Vlastislav Matousek, pianist Martin Kratochvil and percussionist Zangi. Besides studying the Tozan-ryu, he commutes few times a year to Itchoken zen temple in Fukuoka city, Japan to learn its traditional koten honkyoku. Other music back ground includes academic study of piano and jazz theory and ensemble with Ron Perry and Peter Domingues at the music department of Michigan State University in USA and for playing saxophone, toured with local blues bands in Japan, recording CD with local Moravian band, currently studying under Jiri Kulisev from Jaroslav Jezek Conservatory. Kikuo is a performer and teacher of koto, sangen (shamisen), and kokyû (bowed lute) in the traditional Nogawa style, a sub-sect of the Ikuta Schoolentered around the Osaka area. He studied with the Living National Treasure, the late Hatsuko Kikuhara and her successor, Koji Kikuhara.In 1997, he received the performing name of Kikuo. Since embarking on his professional career, Kikuo has won several awards and competitions and continues his studies while maintaining an active performance schedule. He is actively sought as an accompanist forjiuta-mai dances has appeared numerous times on stage, radio and television. He uses his mastery of traditional techniques as a solid basis to extend his musical practices into the present and experiments with various other instruments, both western and Japanese. In addition to many performances in Japan, he also has performed in the US, Switzerland, Germany Italy and Korea.He presently teaches at the Mainichi Cultural Center and the NHK Nishinomiya Gardens Cultural School. He also performs the Heike biwa. Carpathians Project has been active since 1998, established by Anna Nacher and Marek Styczyński (who previously had been a leader Theatre of Sound ATMAN). Influenced by musical traditions of Eastern and Central Europe (most notably the multicultural region of Carpathians mountains, spanning through Romania, Hungary, Ukraine, Poland and Slovakia), free jazz, the philosophy of sound of classical Indian music and contemporary classic the duo creates compositions based on improvisation using plethora of traditional instruments from Asia, Europa and Australia. Prepared electric guitar, home-made analog electronics, field recordings made during their numerous travels around the world and bastardised radio waves add up to the distinct atmosphere of their music. Anna Nacher is also praised for her vocal technique – she has mastered various types of traditional styles of singing known as throat singing, developped through Central Asia and Eastern Europe. She regularly run voice trainings through a series of workshops (Poland, Greece, Germany, Slovenia). The Magic Carpathians Project has released highly acclaimed albums on Obuh Records, Drunken Fish Records, Vivo Records, Requiem Records, Reverb Worship as well as on their self-managed label, World Flag Records. They are present on many compilations released in the UK (compilation “New Music from Central and eastern Europe” released by The Wire), Sweden, the U.S, Italy, toured USA in 2001 and 2006 (playing at many clubs: from Knitting Factory, NYC through SXSW, Austin to Bottom of the Hill, SF as well as performing at legendary Terrastock Festival in 2006) and Europe (Germany, France, Belgium, Netherlands, Switzerland, Sweden, Italy, Central Europe). The cooperations include the split CD with the American group Cerberus Shoal released on Northeast Indie and recent album with guest appearance of Eric Arn (of Crystallized Movements and Primordial Undermind). Listed in All Music Guide. Reviewed in Magnet, The Wire, Downbeat, San Francisco Weekly, Brainwashed.com, FakeJazz.com, Dream Magazine, Ptolemaic Terrascope, The Broken Face (Sweden), Skug (Austria), Rockerilla (Italy). Regularly played at leading free form radio stations across the world: WFMU, KFJC, WNUR , KSPC (in World Top 10 chart for April, the 10th, 2001), WCBN, WMBR, WXYC, KDVS, KZSU, Freies Radio Kassel (Germany), Radio Undo D’Orta (Italy), Radio Centraal (Belgium), Radio Ciutat Vella (Spain) Radio 100, Radio Caroline (the Netherlands), DeutschesRadio, Borderlines, Multi Kulti (Germany), Resonance FM (UK), Radio Akropolis (Czech Republic). Born in Sendai Japan. She learned koto since her little age by her grand mother and mother. Since 1989 she took lessons by Tadao Sawai and Kazue Sawai. When she was Sophia University student in Tokyo, she joined world tour (Austria,Ukraine,Russia,Switzerland,Germany,France and middle and south America. )as member of Sawai Kazue Koto Ensemble. She joined Recordings (d’c records). She graduated from NHK (Japanese National Broadcasting Company) School of Performing Traditional Japanese Instruments and obtained master licence. She was selected cultural internship student by the Agency for Cultural Affairs and received prizes from several contest. She uses her talent in a wide spectrum of activities ranging from premiering new music, commissioning composers, collaborating with other musicians and artists (dance and drama) to playing traditional koto and chamber music. In 2007, she received “Fellowship of the Japanese Government Overseas Study Programme for Artists”. She went to Frankfurt, Germany, to study contemporary music in IEMA (Internationale Ensemble Modern Akademie) and expanded her skill for modern music. Now, she lives in Frankfurt, Germany and regularly performs and teaches in Tokyo(Japan) and Germany. Suizan J.-F. Lagrost is professor of art education at the Conservatories of Le Kremlin-Bicêtre and Asnières near Paris. As a versatile musician, he excels in both the Western and Japanese musics. After a traditional curriculum of concert flute in Mulhouse and Paris, then a DEA of Music of the 20th century at the University of Paris-Sorbonne, he began the shakuhachi in 2000 (Tozan style) and obtained in 2014 the title of Dai-Shihan (grand master). Japanese musician and composer. He began studies of the Shakuhachi at 12 years of age in his native island of Hokkaido. He learned with some of the great masters of the time, including Yokoyama Katsuya. He has received several awards, including first prize in the Hokkaido Shakuhachi Contest and the All Japan Sankyoku Music Contest in 1977. In 1980 he was awarded the second prize in the Pan Music Contemporary Music for Traditional Instruments solo division. Under the auspices of the Japanese Ministry of Cultural Affairs and the Japan Foundation, Sugawara has toured the United States, Portugal, Italy, the former Yugoslavia, and China. He performs many different types of music, from traditional classical music to contemporary, jazz and folk. He also composes and is active as a radio and television performer. In 1993 Gunnar received the Japanese Monbukagakushō Scholarship, to study shakuhachi as soloist, at the traditional music conservatoire at Tokyo National University of the Arts (Tokyo Geidai). After two years of studies, Gunnar passed the entrance exam to the Master’s program, and finished with an MA degree as shakuhachi soloist in 1997, the second non-Japanese to do so. Gunnar received his traditional license, shihan, and the name Jinmei (儘盟) from Yamaguchi Gorō in the summer of 1998, right after the first International Shakuhachi Festival to be held outside of Japan, in Boulder CO, USA. Very sadly, Yamaguchi Gorō passed away only months after that. In 2005, after some 20 years of activities in Japan, Gunnar moved to Europe. He is now actively performing and teaching both privately and through regular workshops in Stockholm and Helsinki, and other shakuhachi events. He is working as Associate Professor at the Department of Oriental Languages, Stockholm University, conducting research in the traditional (or pre-modern) genres of Japanese music. Presently he is studying the structure of some Edo-period music genres, as well as the song texts of the chamber music of the 18th and 19th centuries Japan (so-called jiuta-sōkyoku or sankyoku). Gunnar is also a teacher of shakuhachi at the Royal College of Music in Stockholm (KMH). Doc. Vlastislav Matoušek PhD. studied composition and post-gradual courses in Musical Theory at the Academy of Performing Arts, the Faculty of Music in Prague where he has been teaching ethnomusicology since 1991. There he received his Ph.D. degree in theory of composition. Six months as a fellow of Japan Foundation he studied shakuhachi playing with a shakuhachi master Kifu Mitsuhashi and Japanese Traditional Music at Prof. Yamaguchi Osamu in Japan (1996). Born in 1940, he is a venerated priest of the Rinzai Sect of Zen Buddhism and the head abbot of Hosshin-ji Temple in Tokyo. Hosshin-ji has a centuries old connection with shakuhachi, as it was the Edo urban branch of Reihô-ji Temple, the main Fuke shakuhachi temple in the Kanto Region during the Edo Period (1603-1868). 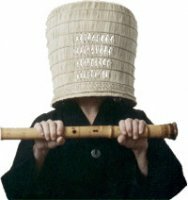 Abbot Kosuge is also an accomplished performer of the shakuhachi, having studied the Kinko Style with Yamaguchi Goro and various styles of Myôan shakuhachi. He began and has sponsored the Komusô Study Group since 1982 and has published numerous books and articles about the shakuhachi, its notation and relationship with Zen Buddhism.